April 5 - May 7: Restricted due to courses at OU. May 8 - May 16: Unrestricted. May 17 - May 22: NASA. May 23 - June 10: Unrestricted. June 11 - June 15: Conference. June 16 - June 30: Unrestricted. W OK SCOTT CURRENS AND I OBSERVED TWO LONG-LIVED SUPERCELLS THAT PRODUCED 4 TORNADOES NEAR THE ELK CITY TO CLINTON, OK AREA. A GREAT MARCH DAY. SE OK SCOTT CURRENS AND I OBSERVED A LONG-LIVED SUPERCELL FROM ARDMORE TO NEW OBERLAND, OK. WE OBSERVED A FEW WALLCLOUDS WITH ONE HAVING A SERIES OF THIN FUNNEL TUBES ALOFT. C / E OK SCOTT AND I OBSERVED THE OKC STORM AND LEFT IT AS IT MOVED OUT OF THE CITY TOWARDS MORE SIGNIFICANT STORMS TO THE SOUTHEAST. WE OBSERVED A SUPERCELL AND WALLCLOUD NORTH OF ADA, OK, AND A MORE SIGNIFICANT STORM NEAR ADA, OK.
S OK SCOTT CURRENS AND I OBSERVED AN HP SUPERCELL NEAR WAURIKA, OKLAHOMA. GOLF BALL HAIL WAS OBSERVED. SW NE SCOTT AND I OBSERVED A SUPERCELL NEAR COLUMBUS, NE THAT PRODUCED A NEAT CONVERGING DUST THING THAT WAS REPORTED AS A TORNADO THAT DID DAMAGE TO SOME FARMING EQUIPMENT. SE SD SCOTT AND I OBSERVED SOME MARGINAL SEVERE STORMS NEAR O'NEIL, NE WITH SOME GORGEOUS MAMMATUS DURING SUNSET. WY WE OBSERVED A STATIONARY SUPERCELL NEAR DOUGLAS, WYOMING, WHICH EXHIBITED GREAT STRUCTURE WITH STRIATIONS AND 50 MPH GUST INFLOW. THAT NIGHT WE HAD STRONG SFC WINDS WITH LOOSE OBJECTS AND DUST IN THE AIR. SD/ND BORDER WE OBSERVED THE STORMS NEAR THE WARM FRONT NORTHEAST OF THE SFC LOW ALONG THE NORTH DAKOTA BORDER. THE FRONT WAS BEGINNING TO SURGE SOUTH AND WE KEPT GETTING 30 F TEMP DROPS BEHIND THE FRONT. WE OBSERVED A NEAT SHELF NEAR DARK AS THE LINE OF STORMS ADVANCED EASTWARD. AGAIN, THAT NIGHT WE HAD A DUST STORM. SC KS MEGA SUPERCELLS OBSERVED ALONG THE KS / OK BORDERS. WE OBSERVED AN INCREDIBLE LP THAT PRODUCED A WEAK TORNADO, AND WE OBSERVED THE SERIES OF TORNADOES NEAR HARPER, KS, INCLUDING A CLOSE WEDGE TORNADO SE OF HARPER, KS THAT WAS RATED F4. WE MEASURED SUSTAINED WINDS OF 70MPH WITH GUSTS IN THE LOW 80MPH RANGE. STRUCTURE WAS JUST AMAZING! C OK BLAH, STORMS FIRED AT 11AM ALONG TWO OUTFLOW BOUNDARIES THAT COLLIDED AS WELL AS ALONG THE SOUTHWARD MOVING COLD FRONT. STORMS FIRED AND QUICKLY GOT UNDERCUT BY THE COLD FRONT. WE GAVE UP AND WERE BACK IN NORMAN BY 0230 PM. S NE / N KS TORNADO OUTBREAK ACROSS NE, KS, & MO. SCOTT CURRENS AND I OBSERVED 11-12 TORNADOES WITH MANY BEING LANDSPOUTS. THIS OCCURRED ALONG THE NE / KS BORDER. W / C OK SCOTT AND I OBSERVED A LONG-LIVED SUPERCELL FROM EAST OF ELK CITY, OK TO THE OKC METRO. IT HAD WALLCLOUDS AT TIMES, HOWEVER IT KEPT GETTING UNDERCUT BY COOL OUTFLOW. AS THE STORM WEAKENED IT TURNED INTO A GORGEOUS LP SUPERCELL WEST OF THE OKC AIRPORT. SC KS SCOTT AND I OBSERVED A LONG-LIVED SUPERCELL AND ASSOCIATED LONG-TRACKED TORNADOES FROM HARPER TO WICHITA, KS. A TOTAL OF 9 TORNADOES WERE OBSERVED INCLUDING 2 SATELLITE TORNADOES. NW TX HP SUPERCELLS IN NW FLOW, MISSED THE SIGNIFICANT HAIL THREAT DUE TO LACK OF GOOD ROADS. SOME GREAT LP STRUCTURE WAS OBSERVED AS OUR STORM DETACHED FROM THE PRECIP CORE. 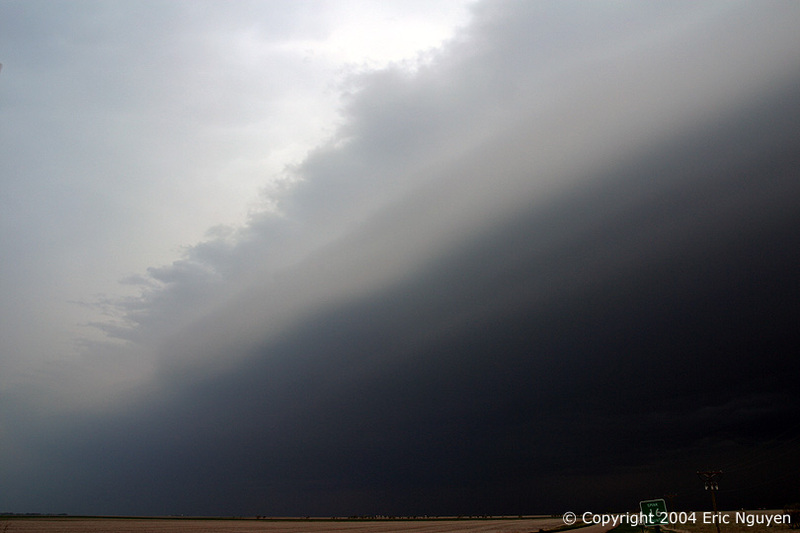 JUNE 2 SW OK STORMS WERE OUTFLOW DOMINANT AND NOTHING REALLY ORGANIZED UNTIL IT REACHED CLAY COUNTY, TEXAS. JUNE 9 NE CO SCOTT AND I OBSERVED 3 DUSTY WEAK TORNADOES IN NORTHEAST COLORADO. WINDS SUSTAINED AT 35 M/S WERE OBSERVED SW OF ONE OF THESE TORNADOES ACCOMPANIED BY TENNIS BALL SIZED HAIL. SW NE WE OBSERVED A LONG-LIVED TORNADO FROM NORTH OF JULESBURG, CO TO NEAR BIG SPRINGS, NE, WHICH CROSSED I-80. THIS TORNADO APPEARED TO BE QUITE STRONG AS IT RAPIDLY MORPHED INTO A CYLINDER SHAPED TORNADO WHICH WE OBSERVED FROM A MILE OR SO SOUTH OF THE TORNADO. WE OBSERVED A SECOND TORNADO DURING THE LATTER PART OF ITS LIFE NORTH OF OGALLALA, NE AS WELL AS OBSERVING BASEBALL SIZED HAIL. S KS SCOTT AND I OBSERVED A VERY PHOTOGENIC SUPERCELL WITH A LONG-LIVED TORNADO SOUTH OF WICHITA, KS. 4 TORNADOES WERE OBSERVED ALONG WITH BASEBALL TO SOFTBALL SIZED HAIL. NE NM SCOTT BLAIR AND I OBSERVED A SUPERCELL DEVELOP ON THE FRONT RANGE OF THE ROCKIES AND MOVED SOUTHEAST INTO RURAL NEW MEXICO. SOME OF THE MOST RURAL ROADS I HAVE EVER BEEN ON WERE TAKEN IN ORDER TO CONTINUE TO OBSERVE THIS STORM. 1.5 INCH HAIL WAS OBSERVED. C OK AWESOME CLASSIC SUPERCELL AND 2.75 INCH HAIL WAS OBSERVED BEFORE THE STORM TURNED INTO AN LP DURING SUNSET NEAR STRATFORD, OK.
AUGUST 7 E NM SCOTT AND I OBSERVED TWO SUPERCELLS OFF THE FRONT RANGE OF NEW MEXICO SOUTH AND ALONG I-40. WE HAD A LATE START OUT OF SANTA FE AND DIDN'T GET TO THEM IN TIME TO OBSERVE ANY SIGNIFICANT HAIL, HOWEVER, WE DID GET SOME GOOD STILLS OF THE STORM AND LIGHTNING THAT NIGHT. E CO SCOTT AND I OBSERVED AN LP SUPERCELL WITH GREAT STRUCTURE NEAR LAMAR, CO. THIS PAGE AND ITS IMAGES ARE COPYRIGHTED BY ERIC NGUYEN. ANY REPRODUCTION OF THIS PAGE AND/OR ANY OF ITS CONTENTS IS A VIOLATION OF FEDERAL LAW.